I had my third mapping appointment this afternoon. I actually didn’t want to change my mappings (a rarity for me) and was glad when my audiologist said she wanted to do a sound booth test instead of mapping. Here’s a bit of background before I explain today’s sound booth results. The numbers at the top of an audiogram are the frequencies in Hz and the numbers on the left are the dB values. 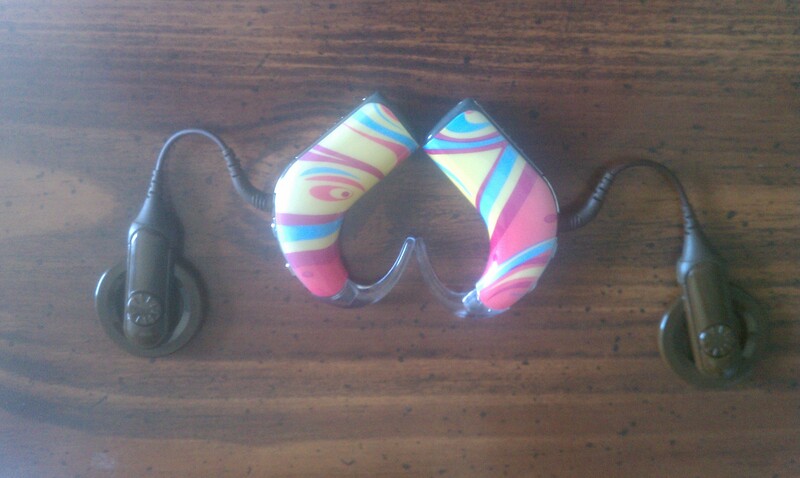 Pink: My residual hearing prior to surgery. You can see that it goes right off the graph and I basically had no high frequency hearing whatsoever. 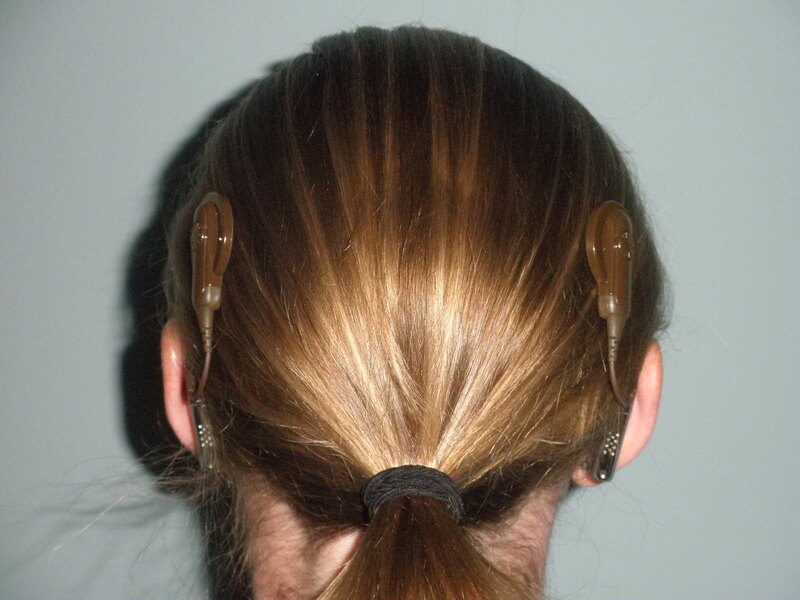 Green: Hearing test with my hearing aids January 2009 when I was being evaluated for a CI. Those hearing aids were pretty cool. The aids more or less transposed all frequencies into the little pink area I had residual hearing in. Purple: Hearing test with my CI. Black line: Anything above this line is considered “normal hearing” which is between 0 and ~25 dB. Red smiley face: I love that my audiologist put a smiley face there. I was born with profound bilateral hearing loss and was diagnosed at 20 months of age. 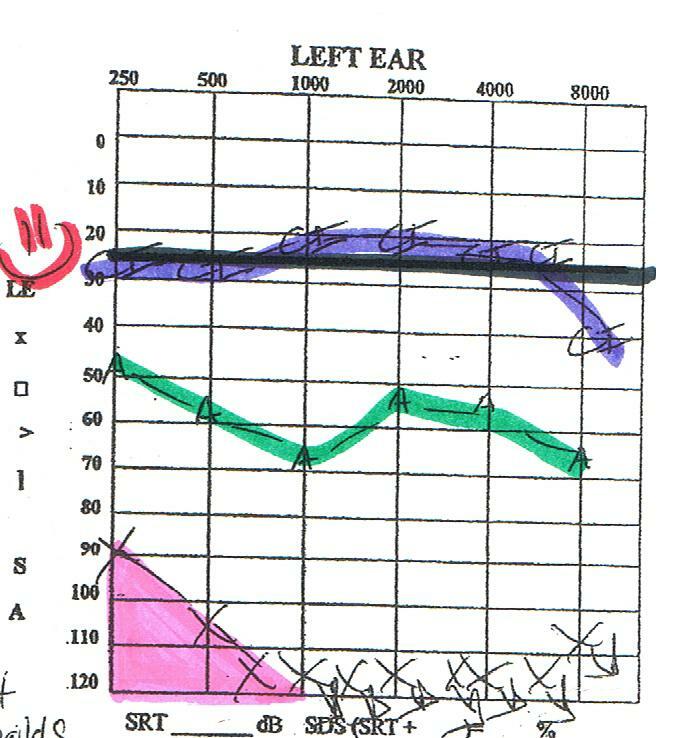 If you look at my audiogram from when I was 20 months and compare it to my audiogram from before I got my CIs (surgery damages residual hearing)…they’re exactly the same. You also would not be able to tell which one was the left ear and which one was the right ear. Residual hearing was the same in both ears. When I was first diagnosed my audiologist used a jet as an example to help explain my hearing loss. If I stood right next to a jet, I may or may not be able to hear it. If I could hear it, it would be very quiet and difficult to hear. Here are my audiograms from today’s sound booth tests. The right ear (newly implanted) actually looks like it’s the “better” ear on paper. Overall the right ear falls mostly in the 20 dB range and the left ear falls mostly in the 25 dB range. My audiologist said these audiograms couldn’t look any better. A 20-40 dB range is expected with CIs. I was able to pick up all the tones at each frequency above the speech banana. Pretty cool. Kind of hard to explain to people that I’m profoundly deaf but I have “normal” hearing on an audiogram…but I don’t always understand what I’m hearing. I hear a lot of what the average hearing person hears but I don’t process sound the same way which results in me still appearing “deaf” even when I’m “hearing” sounds. I was thinking about how I prefer being bilateral and how it feels like I’ve been bilateral for a while….then I realized it hasn’t even been a week. It just feels right. It feels natural. I suspect a lot of that has to do with the fact that I always wore two hearing aids. I HATED wearing just one if the 2nd one didn’t work (which seemed to happen every 2 weeks the last couple of years I wore hearing aids) so much that I would avoid wearing it unless I HAD to. 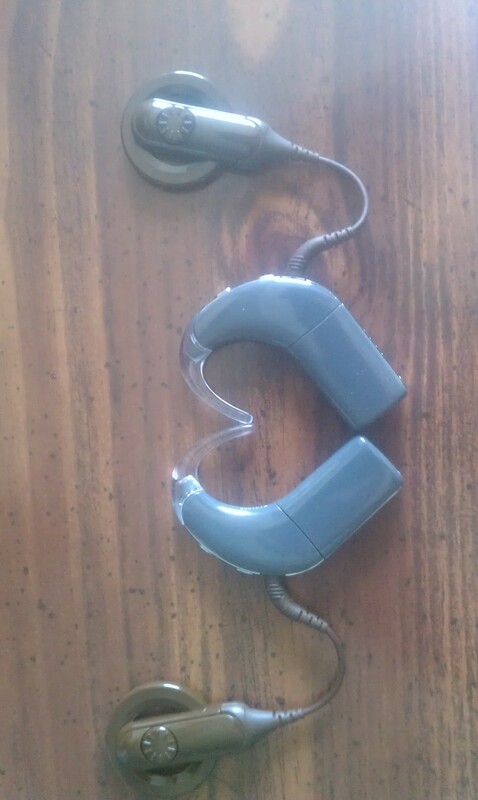 With just one hearing aid, I could only pick up 50-60% of what I felt I could pick up with both hearing aids. It was always either all or nothing for me. 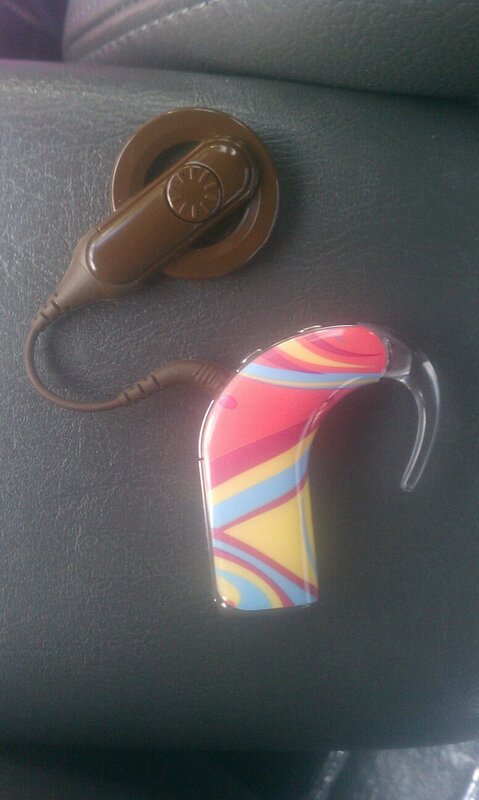 I would either wear both or I wouldn’t wear hearing aids at all. There have been several situations recently where I would take off one CI just for a few minutes just to see if I could tell a difference between being bilateral or not. Oh man…it makes such a big difference in the quality of sound….I don’t know how I put up with hearing out of only one ear for 2.5 years. Of course, there have been bumps in the road and I need to remind myself to be patient until I get more used to being bilateral. Things are louder and I am more sensitive to sound. I do ok in noisy settings but it’s the quiet settings that bothers me because I’m picking up every single little sound and they stand out more. When I turn a page in a book..I jump and my heart races because of how loud and unexpected the paper sounds. That being said, I haven’t been wearing my CIs much at home (bad Kelly, I know). However, that’s also to be expected anytime someone gets a new CI. You have to work up to wearing it for longer and longer periods of time. It wears me out. I don’t realize how hard my brain is working until I take my CIs off…..then my body just totally relaxes. Bottom line is that even though there have been speed bumps in the road, it was the right decision for myself. I am looking forward to the day where I learn to tune out those measly little annoying sounds so that I can wear both CIs all day long. It feels right. It sounds right. Today was my week #2 MAPping for the newly implanted (right) ear! My audiologist switched the program strategy from SPEAK to ACE and remapped the right CI. The right MAP is different than the left MAP. One big reason is because I had a lot of issues with neck nerves being stimulated on the left side of my neck. It’s actually a split-second painful sensation that occurs with certain pitches at certain volumes…one example being the garage door opening while I’m in the garage. It still happens every once in a while but it usually goes away the longer I wear my CI during the day….thankfully it doesn’t happen often. So far I haven’t had any issues with having odd stimulation with the new implant (*knocks on wood*) and I have a greater tolerance for “comfort loud levels” than with the older implant. The new CI still sounds different than the older CI because my brain is still getting used to it. Sounds are still a bit high-pitched, quieter, and not as clear as my older implant. The MAP for the older implant is narrower and almost uniform all the way across. The MAP for the newer implant is not as narrow and it has an upward slope. Of course this is just a generalization and from memory. Below is a picture of a cochlear implant MAP that I found online (it is NOT my MAP). 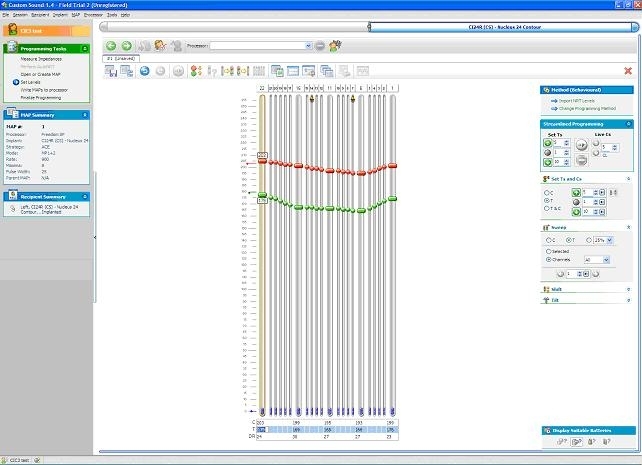 The green dots are when the person started hearing sounds at that electrode and the red dots are when the person reached their tolerance for maximum comfort loud sounds at that electrode. So far, I like being bilateral. Music sounds AWESOME! It’s so nice to pick up sounds all the time instead of it disappearing or becoming quiet when I turn my head away from it. Sounds are definitely louder, richer, and fuller. Ignore all the flyaway hair. 🙂 Again, I’m very pleased with the job my surgeon did. He made the implants pretty symmetrical taking into consideration things aren’t always exactly the same on both sides of a person’s head and the surgeries were over 2 years apart. The older implant is the dominant ear right now and there have been moments where I wonder if I’m even picking up anything with the new implant. I will take off the new CI for a bit and sure enough something sounds like it’s missing….it’s not as rich and not as full when I have both CIs on. My audiologist told me to go ahead and wear both CIs all the time now. She said that if I feel the need to see how the new CI is doing to just wearing it for a brief period of time. I have to say I am very glad I did not get both CIs done at the same time. There is NO way I would have been able to tolerate both CIs and I may not even have stuck with it. I also found great comfort in knowing I had a back-up ear that I could go back to wearing hearing aids with if the first CI did not benefit me. However, I do kind of think I should have gotten the second CI a year later rather than waiting 2.5 years. I was trying every single option to avoid having a second surgery (trying to get used to hearing out of only one ear, trying out different hearing aids, etc.). Being bilateral will take some getting used to and it will wear me out for a few weeks…but am very excited and am enjoying it already! Monday was my birthday which means I’m another year older! On Saturday Dennis took me out to dinner at an Italian restaurant while some friends got together to throw a surprise party for me. I’m impressed that they were all able to pull it off at Margarita’s Restaurant especially after I happened to ask a few friends if they wanted to go there before going to Power & Light District for the evening. I was wondering why everyone was giving me odd answers all week and why they seemed like they didn’t want to head to Margarita’s (which is highly unusual). I also picked up on a few unusual things with Dennis (e.g. him being on the phone more often) but I chalked it up to having out-of-town friends in town. I didn’t put it all together until afterwards. After wrapping up work on my birthday (Monday) I took Mojo for a walk and enjoyed some time at the neighborhood pool (everyone is back in school so it was wonderful having the pool all to myself). I also went out to dinner with my Mom, Dad, and Dennis…good times were had! I got a Kindle and a few other neat birthday gifts. I also enjoyed all the cards, texts, and Facebook birthday wishes. Thanks everyone for making this a special birthday! Hard to believe it’s been a month since I have had surgery, time flies! Things have gone wonderfully! The incision is still a bit tender to the touch and a bit stiff when I yawn. Other than that, recovery has been smooth. I can also return to all activities with no restrictions….hopefully gymnastics will go okay next week. Valerie is in town this weekend! 🙂 A few of us went to the Plaza yesterday for dinner and to give Valerie a taste of Kansas City. 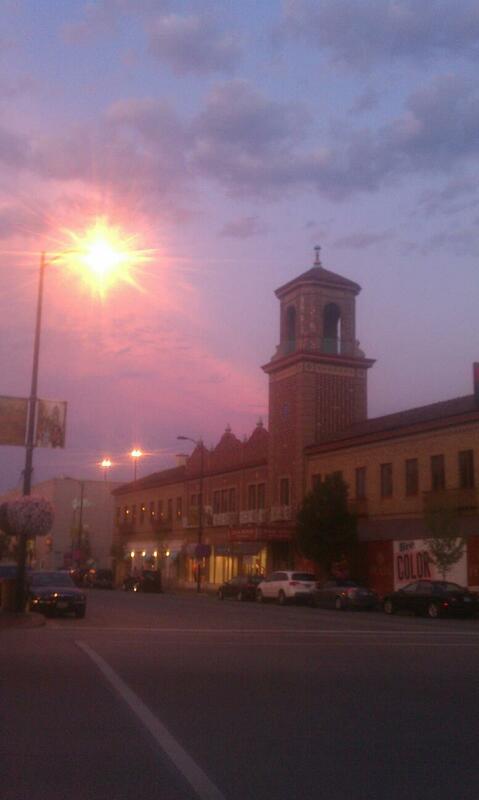 We walked around the Plaza after dinner and checked out a few shops. There were also a few street musicians. At one point I kept hearing this really high-pitched noise (remember, things still sound high-pitched to me). I couldn’t figure it out. I thought maybe it was a car horn but it was going on too long for it to be that. I had to ask what it was and turns out it was someone playing the saxophone. It didn’t quite sound like music to me….just this really high-pitched weird sound. 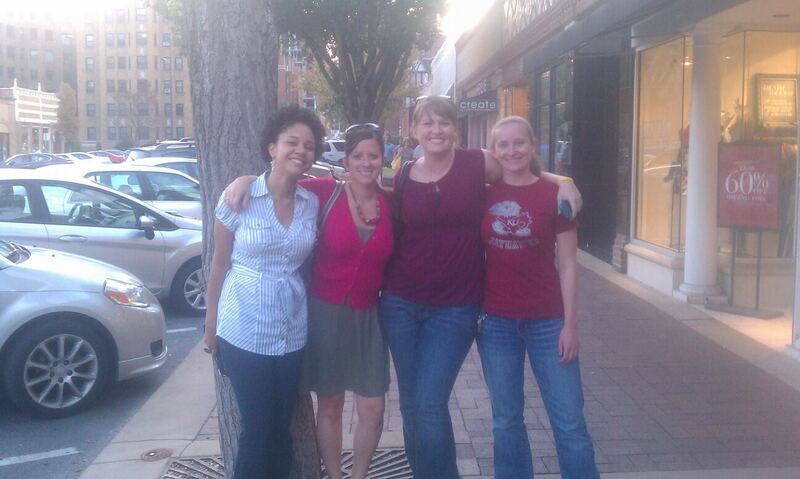 Mat, Sarah, Valerie, Lucy, Dennis, and I went to Jack Stack Barbecue for dinner tonight. KC BBQ restaurants almost always ask if you want fries as a side. I was sitting next to Dennis and was enjoying the fact that I could finally start to pick out people’s voices in a restaurant setting. Voices sound really quiet to me at times just like it did for a while with my first CI. Anyways, Dennis was ordering his food when the waiter asked if he wanted rice. I was confused as to why a BBQ place was asking if Dennis wanted rice with his food….it just didn’t make sense. I was getting ready to ask Dennis if he ordered rice with his BBQ meal when the waiter asked what I wanted. I have started several posts about certain topics which I always end up deleting because they end up being super duper long and I know readers will get bored! I did find myself Facebooking about those topics and was only limited to 500 characters instead of the 500-page book I felt like I was writing every time I started blogging. I know this is a bit redundant to those who are my Facebook friends (my apologizes) but I wanted to cross these items off my to-blog list especially since I always say I’ll post more about these topics at a later date and I never get around to it. 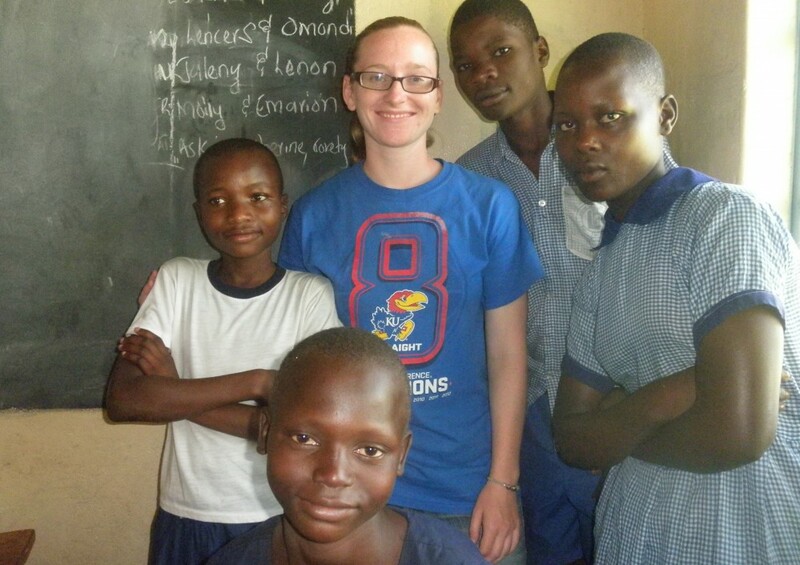 Joplin started school yesterday which is just amazing. About 14,000 of the town’s 50,000 resident lost their homes in the tornado and half of the schools were damaged (6 will have to be rebuilt and 4 buildings will have to be repaired). If you do the math, that’s almost 1/3 of the town’s resident. Here’s my Facebook status….yeah, I’m pretty proud of Joplin. I know I’ve posted this before but I’m so doggone proud of Joplin. About 54% of Joplin’s 7,700+ students were affected by the tornado. Out of about 18 schools, 10 schools were damaged. Around 92% of students are expected to return this year. Temporary buildings were built in 55 days and the new school year is expected to begin tomorrow as scheduled. Joplin, you’re amazing….you have shown the world the importance of pulling together as a team to achieve a goal and that nothing is impossible. Oy, I’ve tried to write a post about all the situations that I found myself in as a deaf kid who was mainstreamed but it always turned out to be a long rambling post….one that I’m pretty sure would put people to sleep. Buses wouldn’t pick me up, schools tried the “out of sight, out of mind” approach, teachers made fun of me, schools wouldn’t give me a class schedule, and teachers would try to kick me out of their class by saying a deaf kid wasn’t capable. For that reason I’m thankful I was able to receive an education and it saddens me to hear so many people view going to school as a chore…….please seize every opportunity you have to learn and don’t take having access to education for granted…..